Augmented Reality (AR) and Virtual Reality (VR) will change everything. The way we work, play, buy and communicate will be forever revolutionized. With such tremendous promise and upside, every savvy investor should be familiar with these technologies. AR and VR are less of a trend and more of a new way of life — allowing us to amp up reality as we know it, expanding the possibilities of what we can experience and accomplish. Every major tech, entertainment and retail company wants in. So, What Exactly is AR/VR!? These applications are new and continuously advancing, so there is an education process that needs to take place in order for consumers (and investors) to become familiar with what, in fact, VR and AR actually are. AR enhances how users interact with the physical world — digital images and information are superimposed onto the user’s environment. A popular example is the Snapchat (NYSE: SNAP) dog filter: through a smartphone camera, the app is able to identify your face and overlay it with ears and a snout. There are still “real world” elements — your eyes, hair, and forehead — but features are digitally added to “augment” your experience. VR, on the other hand, places the user in an entirely different world that is fully digitized. For example, you can put on your Oculus Rift headset anywhere in the world, and instantly transport yourself to The Grand Canyon where you can choose to tour the world-famous landmark in the sun or moonlight and take in the rock formations and wildlife. VR depends on a headset, while AR is most commonly experienced through a smart phone or specialty glasses. AR and VR are also lumped into the umbrella term XR, which stands for “Extended Reality.” When the expression “XR” is used, it references both AR and VR technology. According to MarketsandMarkets, the VR market is expected to grow from $7.9 billion in 2018 to $44.7 billion by 2024. Statista reports even larger growth, predicting that the combined revenue of AR/VR (also called XR) worldwide will expand from $6.1 billion in 2016 to $192.7 billion in 2022. This is an increase of over 30x… within 7 years! Considering these numbers, it is no wonder that some of the most powerful companies are fighting for a piece of the market. In the past 5 years, the actual technological advancements in XR have not delivered what was promised — customers have been continuously let down due to clunky and complicated hardware and an uncomfortable user experience. Finally, in 2019, there are a number of businesses who are coming out with affordable XR hardware, and applications that are also easy to use. As an investor, I think it is important to know the major players in the space and the products they have released, as this gives you a more robust and informed understanding of the whole market segment. Even with the onset of major companies releasing headsets and glasses, it has proven to be extremely difficult to convert curious onlookers into buyers. I believe the entertainment industry is what will truly break VR and AR into the mainstream. Gamers, in particular, are especially receptive to new technology that offers ways to improve their gaming experience. The power of AR gaming is exemplified by the unprecedented success of Pokémon Go, released by mobile game developer Niantic in July 2016. In the first 200 days of its release, players spent $1 billion on in-game upgrades — generating a record-setting amount of revenue for an app. The premise of the game is to capture different creatures, sending people on a mad chase through their city to find them. You catch one by pointing your screen at the monster and throwing a “Pokéball” at it. What is most interesting about its success is that Pokémon Go attracts a substantially different audience than is typical for a popular game — proportionally more women and older users. It hasn’t taken users away from their favorite games, but created new gamers altogether, which points to the unique opportunity AR games have to engage new audiences. I couldn’t write an article about XR and not mention Magic Leap, which often dominates news coverage because of its quirky founder (Rony Abovitz), its secretive practices, and massive investment from some of the biggest corporations and venture funds in the world. In October 2014, Google invested $542 million in Magic Leap…over half a billion dollars! By the end of 2018, the company had raised $2.3 billion dollars at a $6 billion valuation from investors including Qualcomm (NASDAQ: QCOM), Disney (NYSE: DIS), AT&T (NYSE: T) and Alibaba (NYSE: BABA) and venture capital firm Andreesen Horowitz. These numbers speak for themselves — Magic Leap is a dominating force. Even though they are a private company, I believe Magic Leap is crucial to follow because of its top tier investors and reputation as an industry leader. The Magic Leap One headset was released on August 8, 2018, priced at $2,295. Developers were the primary audience for this first edition, and it is able to deliver both VR and AR experiences. Magic Leap has also partnered with Weta, the famed New Zealand special effects studio, founded by Oscar-winning director Peter Jackson. They created the special effects for The Lord of the Rings trilogy, among countless other films. Weta Gameshop, a division within the company, is working specifically on AR games for Magic Leap. Dr. Grordbort’s Invaders, developed by Weta Gameshop, is an AR game available as an exclusive download on Magic Leap One. In the game, “evil robots come out of the walls of the living to stage an invasion,” and you have to shoot your way out of it. Although the headset is made for developers, it is clear that the company has their eyes set on gaming as the way to attract a more mainstream audience. AR and VR Need 5G! With the continuous development of AR games comes increasing requirements for data and powerful wireless connectivity. Before the release of Magic Leap One in August 2018, the company announced “a strategic alliance and a new investor,” AT&T (NYSE: T). They are “the exclusive wireless distributor to consumers in the US of Magic Leap One,” meaning that the device can only be purchased at select AT&T stores. As XR applications grow, highly developed telecom infrastructure will be imperative. This is especially important for VR and AR games in which multiple players can engage at the same time. 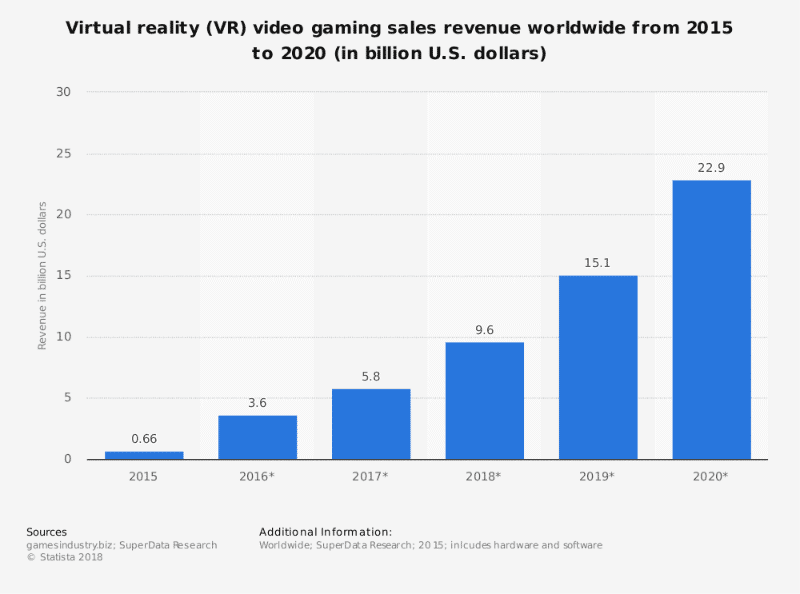 Although VR technology is not as developed as its AR counterpart, the forward-looking numbers for VR gaming are massive: Statista estimates that VR video gaming revenue sales worldwide will increase from $660 million in 2015 to $22.9 billion by 2020. However, incorporating VR into gameplay creates several difficulties — what works on a flat screen may not work with a headset. Sony went full force into the VR gaming market in 2016, when they released their PlayStation VR headset, which has sold more than 2 million to date. Like Magic Leap, PlayStation also has a range of exclusive VR titles. While VR headset sales haven’t yet lived up to projections, sales are predicted to increase as the technology develops, games adapt and headset producers add more exclusive titles. AR and VR applications are not only promising in the entertainment industry, but also present major opportunities for improving training and boosting productivity in the workplace. Microsoft secured a $480 million contract to supply HoloLens headsets to the US Army (beating out Magic Leap) to “rapidly develop, test, and manufacture a single platform that soldiers can use to Fight, Rehearse, and Train…”  It has also become the go-to headset for the British Royal Navy and the Royal Australian Air Force. In September of 2018, the UK-based Alzheimer’s Society embarked on a 3-year research project using VR to attempt to detect early signs of Alzheimer’s disease. Preliminary results suggest that the VR-based navigation test was more accurate in diagnosing Alzheimer’s-related impairment than traditional “gold-standard” tests. VR is also being tested for its accuracy in diagnosing vertigo, ADHD, concussions, PTSD and cancer. In response to the tremendous opportunities that VR and AR present in the workplace, Facebook is looking to target the commercial market, developing “enterprise editions” of Oculus Go and Oculus Quest VR headsets, which are expected to launch this year. Beyond entertainment and workplace applications, XR will revolutionize how we engage in retail experiences — both in store and online. AR, most notably, will open up novel and more intimate ways for consumers to learn about products, allowing them to virtually test out how an item might look on their body or in their home. Several prominent companies have already begun to integrate AR capabilities into their ecommerce platforms including Sephora and Dior, which allow consumers to try on makeup and sunglasses, respectively. These applications have proven to be tremendously effective. Lowe’s Vision (NYSE: LOW) is an app that allows the home hardware store’s customers to see how products look in their home. In response to the success of AR retail applications, Toronto-based NexTech AR solutions (CSE: NTAR / OTC: NEXCF) is rolling out a new “try-it-on feature” — through an iPhone camera, a user is able to virtually try on “eyewear, jewelry, and clothing to check fit and styles,” which will be helpful to multinational retailers looking to add AR into their repertoire. These technologies are creating an entirely new way of life. How we work, shop, play and communicate will forever be changed. It’s the beginning of a revolution. And revolutions come with tremendous opportunities… just make sure you don’t miss this one. If you want to invest in cutting-edge, transformational technologies — you have to keep a close eye on AR/VR. We’ve seen some of the most powerful companies in the world rushing into this space, investing hundreds of millions of dollars. This speaks to XR’s tremendous financial upside, but we are still in the early stages of development. This means that there is a massive runway for small and mid-tier companies to enter the industry, some of which will win big. Keep your eyes peeled in the next 24 months for those smaller players that will leverage XR’s hype and promise. The revolution has begun and it’s one you can’t afford to miss…. Blake is positioned to become the leading millennial investor voice for cutting-edge technologies. She acquired her first Bitcoin in 2014 and immersed herself in the crypto sector. In 2016, she began a master’s program, diving in head first, at the University of British Columbia (UBC), where she focused on how blockchain technology can be utilized within the art industry. Recently graduated, she is now committed to bringing investors the millennial perspective on emerging technologies.